This is a synthesizer board for your Arduino, Teensy, Raspberry Pi or basically any board with an SPI interface and a few extra IO pins! It uses the classic YM3812 OPL2 sound chip. The same chip that was used on the Adlib and Sound Blaster sound cards. You can use it to play back music of your favorite classic games on a real chip, compose your own tunes and whacky sound effects, or play around with the YM3812's FM-synthesis. What about the hardware and software? 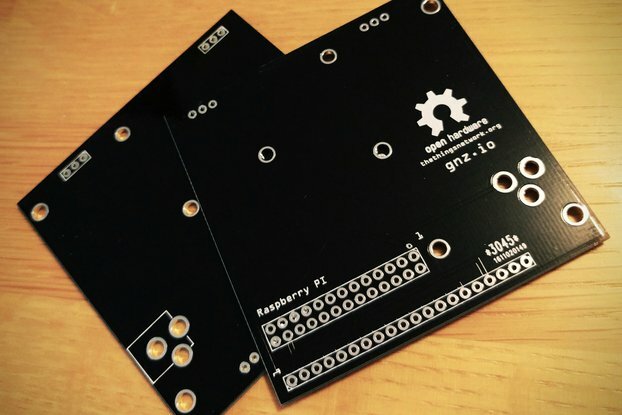 You can choose to get a board fully assembled and tested or as a kit to assemble yourself. For kits I always test the ICs before sending! The kit is very easy to assemble and the software library comes with a bunch of examples to get you started within an hour. Since I don't like to discriminate between development platforms the software is the same for Arduino and Raspberry Pi like boards. It is easy to switch between target platforms by changing a variable. By default platform is set for Arduino, Teensy, Node MCU, etc. 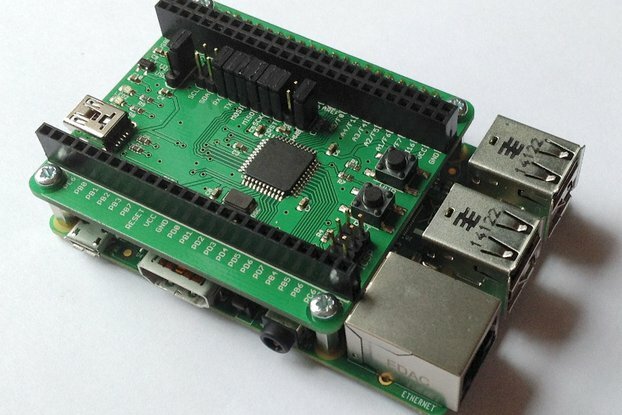 For Raspberry Pi, Orange Pi and other Pi like boards an installation script is provided that will take care of all the hard work to compile and install the library. Audio quality of the OPL2 Audio Board is great, although I recommend using it with active (amplified) speakers for the best results. Excellent quality, great fun kit. This was just what I was looking for - aside from being a great nostalgia trip to revisit the music from games I enjoyed years ago, this kit is great for understanding more about how the hardware works, and experimenting with its capabilities. Since the board is essentially a nice serial interface to the YM3812 (plus a DAC and amplifier), you have full control over the chip. The kit is very easy to assemble, with concise but clear instructions. I was concerned I might have to source the YM3812 and Y3014B chips myself but all the parts, including all the ICs and sockets, are included and carefully packaged. There's comprehensive software support too - I haven't used it with an Arduino yet, but for Raspberry Pi there's a library that takes care of communication with the board and some great example code, including a player program that can handle a few different file formats. There are even a few sample tunes included, so it takes very little time to get up and running. Ordered the board last year because of nostalgia (the Ad Lib card was my first music card), didn't actually came around to using it until recently. 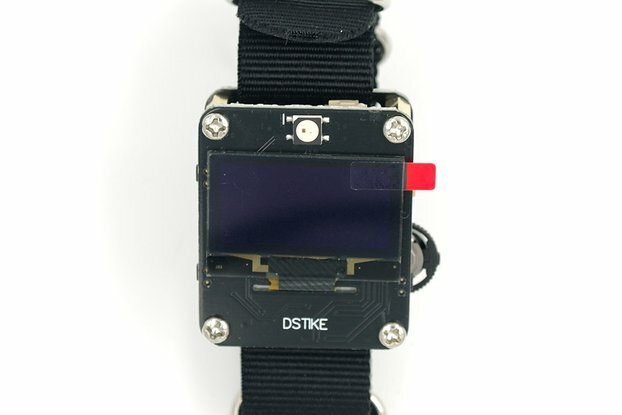 It's a very nice design, and very easy to connect to an Arduino with the given instructions. The API documentation could be a tad bit better, but with the examples and source code available, it's easy to program. Really cool board. Works as advertised. I bought this board to try and make a strange self-made synthesizer, using a DIN5 midi connector, and, at some later stage, with an actual physical control interface (currently it listens to commands over the usb serial cable, so I can test it out). I have a question though: it seems my midi code is much more silent than the dosbox example, and if I try to increase the volume, it seems to be distorting the sound. The dosbox example is a lot more loud, but doesn't seem to distort. The DosBox example is using the OPL2 output from DosBox, so there you rely on the conversion from MIDI to OPL2 provided by DosBox. If you look at the TeensyMidi example then you see that I'm also jumping through some hoops to calculate good sounding values for the volume as I was having the same issue. I'm not sure if the MIDI volume scale is supposed to be logarithmic, but that could be the source of it. I hope this is helpful to you. Board arrived well packaged and quickly. The PCB is high quality and great value for the price. Was easily able to follow the instructions and example code to get the board up and running with an Arduino and Raspberry Pi. Now ordered a Teensy to explore Midi. 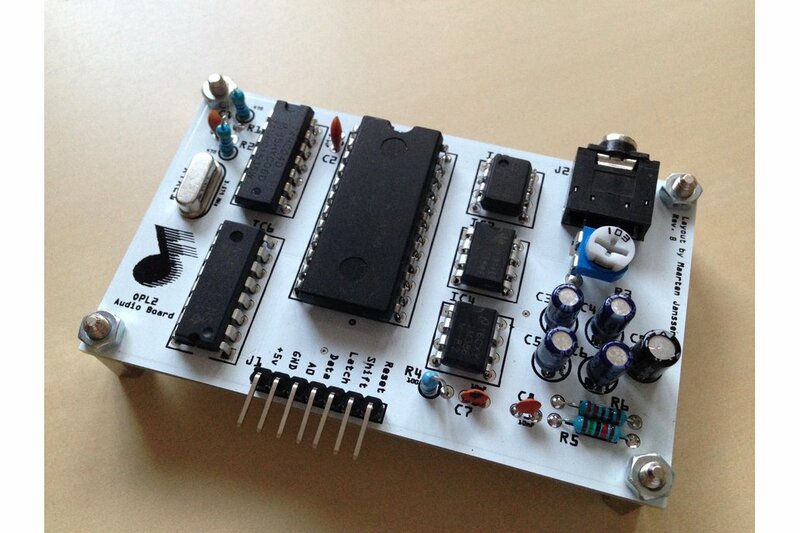 This is a great little board which makes it easy to play around with a classic FM chip. The library also offers some useful functions I wasn't expecting (e.g. a single command to load an instrument from a byte array, configuring all aspects of a channel and its ops in one go). For me, though, the best part is that it's possible to directly write any value to any register on the board, meaning you can take full control of the OPL2, even allowing things for which there are no library functions, e.g. CSW mode for speech synthesis fun. There is a lot of noise even with the volume pot at minimum (muted) when using headphones directly, so definitely use a separate amplifier (as others have recommended), which allows you to set the board's volume high enough for the signal-to-noise ratio to be much better. Also, there is a "DosBoxPassthrough" Arduino example included, but it would be nice to know how to use this with DOSBox (is a modified version required?). Just make sure you start with the volume pot fully anticlockwise, as the audio output can get extremely loud and distorted (I've never been able to take it above 50%). I'm very happy with the board will probably buy a second one so that I can have a dual-OPL2 setup. The Python example was kindly contributed by another user. Since I'm not an expert Python coder I will try out your changes and see if I can add them in the next library update :). As you requested I will not mention your name. For the DosBox passthrough there is a modified version of DosBox available on my Github page https://github.com/DhrBaksteen/ArduinoOPL2.DosBox. It includs a build for Windows and allows you to use your OPL2 board as a real sound card. You simply configure the COM port in the DosBox config (See the readme.md). I'd love to hear from people using this custom build to hear what they think and if they have any suggestions! Works great, super easy to assemble, and really cool to hear some real OPL2 tunes. I was pleasantly surprised to find a complete set of IC sockets supplied even though the assembly instructions mention them as optional. I look forward to getting it up and running as a MIDI controlled device. Remarkably, it runs fine on a 3.3V supply being controlled and powered by a Teensy 3.5. I had a huge smile on my face when I opened up this little box. I could tell that a lot of care and love went into this kit, and it's been a pleasure to tinker with. I'm very excited to play around with the libraries and make some weird sounds! There's no tracking on the shipping, but I think that's a fair trade off for $5 transatlantic shipping. Mine arrived within two weeks to the US. I put this together while on discord with my friend. It was really easy and then I got to listen to some nice chip tunes when I was finished. Connected it to the adafruit metro, same as the Uno. Worked great, wiring was easy enough too. :) the second board had arrived, finally. and today i tested it. just works, perfectly. Received the product in a week or so- GREAT BOARD! Only complaint I'd have is the board is a bit too noisy, but maybe it's me? My board arrived today (shipping 3 days to Belgium), just soldered it up and I'm over the moon ! I cannot give this product & merchant enough thumbs up. Open sourced design, nicely packaged & excellent documentation. It's a very easy soldering job, good clearance between components, while still keeping the board size small. Loaded up the demotune sketch on a teensy 3.2 and it works like a charm. If you are considering this, just go for it, you'll love it. Amazing - easy and genuine! The kit arrived super fast - 4 days from Netherlands to Switzerland. Nice retro sound and good examples. In all fairness, I've been in contact with this buyer for a few weeks and offered a refund. The kits are sent untracked, which as the name implies, means that I don't have a tracking number. If someone thinks that's too big of a risk then you're always free to enquire about sending the kit as a tracked package. I simply do not offer this normally because that makes international shipping almost cost as much as the kit itself. This is the first time that a kit has not arrived and I am very sorry about that, but there is simply no more I can do than to offer a refund in this case, which I think is fair. I spent part of a Saturday soldering it up and it worked like a charm. Tons of sound files available online to play through it. Sound quality is excellent. Built the kit before breakfast, tested it after, easy build, good board layout and it works a charm. Thanks! The kit arrived very fast and was easy to assemble, everything is clearly marked on the PCB and the guide explains things like polarity of elements where it might not be obvious. I accidentally swapped two LMxxx OpAmps so it didn't work on first try but thankfully nothing happened to them :) Library and other source codes look great too, clean and with enough comments. Thank you! OPL2Audio Board is a really interesting product: You get access to OPL2 features in a "easy way" ( via programming library ). You get everything you need in the shipped package. The library code is well written and at first look, seems to fit well with any "code customization". I've tried the board with Arduino and it worked like a charm. In the documentation it's clearly suggested to use *amplified* speakers. First I used a couple of old-laptop-NOT-amplified-speakers ( extracted brutally from the case ) and the audio was good at low levels ( as soon as I raised it, it was noisy ). Then I've tried with amplified speakers and the audio quality was absolutely good!!! I've built the board in a couple of hours and It was the *first* soldering work I did in my entire life ( a part from some guitar cable fixing ). If I should suggest something to get even more better, I would say that in "assembling the board" documentation, could be useful some explanatory picture. Other than that, it's really good. The board is amazing, I first ordered a construction kit, but I destoyed something and the board didn't work. So I ordered a built one and it works just as expected. You can mix this with other libraries and it will work perfect, I could use the 3 pin lcd library, and the IR remote to control a menu to read songs from SD. The only bad thing about this, is the seial and the sd libraries can sometimes fill the ram and make the samples not to work, I'd recommend using another library to read from sd and for serial. I tried "Petit FAT File System Module" which uses far less ram than SD, and it worked, but I could not port all the code, and never got the correct playback speed. Also the card produces a little noise, but it you set the volume a bit higher the sound is very very clear. I was surprised how fast it was shipped, since it traveled half way around the world. Took no time at all to solder up and worked the first time I powered up and loaded demo code to arduino. Build instructions were easy to follow. The demo code and library files are easy to follow with comments to make it easy to custom write your own code. The sound is rich and like I remember from my DOS days. The maker of the kit answered my questions right away and makes a solid cool sounding product. I look forward buying more kits from him. There was a time when the only way to get nice sound and music from a computer was with a dedicated sound card. The OPL2 Audio Board is an nice design that produces those original sounds on original hardware. Emulators and converters on big computers are great, but the OPL2 produces sound like an Arduino computes -- simply and inexpensively. The board was easy to assemble -- the online instructions are clear and accurate. I also used sockets for the ICs. I've seen other FM sound boards with a MIDI input -- perhaps the OPL2 board would make an interesting MIDI synth? The kit was delivered to Italy in a very reasonable time. A pin on the jack connector was bent on the way but it was easily fixed. The most important parts (the chips) were indeed well protected. Assembling the kit was straightforward due to component values printed on silkscreen. I added IC sockets just in case something bad happens to the chips. Wired to an Arduino and uploaded example code it worked almost instantly, as it took me some time to realize that the working range of the trimpot is actually very narrow. Sound on simple amplified speakers is great! Example code is very useful, but I still have to test it thoroughly. About price, either other kits on the market are way too overpriced or this one is a bit underpriced: that tells me it was surely created with passion! I'd finally suggest Maarten to use his experience to design and sell similar boards for other famous Yamaha sound chips. Sehr gutes PCB-Design, klasse Sound! Das OPL2-Audio Board ist jeden Cent wert. Er ließ sich problemlos sowohl an meinem Pi, als auch am Arduino Uno und am Teensy 2.0 ++ als Midi-Gerät anschließen. Hierfür ist allerdings zwingend Python 3 zu installieren, da es ansonsten zu Fehlermeldungen auf dem Pi kommt. Der Sound klingt wie aus der guten alten Soundblaster-Zeit. Ansonsten kann ich nichts negatives zu diesem Projektboard sagen. Vielen Dank für dieses Stück Nostalgie! The OPL2 audio board is worth every penny. It could easily be connected both to my Pi, as well as to the Arduino Uno and the Teensy 2.0 ++ as a Midi device. For this, however, it is mandatory to install Python 3, since otherwise there will be error messages on the Pi. The music sounds like from the good old Soundblaster. Otherwise I can say nothing negative about this projectboard. Thank you for this piece of nostalgia! 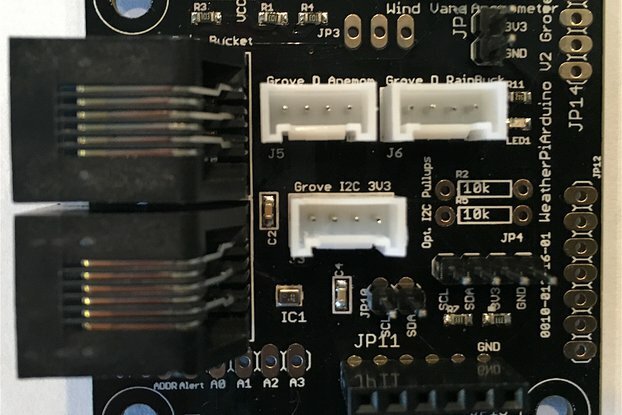 I have been using this with an arduino to experiment with connecting an opl2 to my midi keyboard, and at least the opl2 part of it is working perfectly like I hoped for. With small tweaks to the arduino examples in the github I can easily change between the included midi instruments. I feel like the 20 usd price is almost too low for this kit and would recommend this for anyone wanting to play with an opl2. The only thing I would improve would be some of the markings on the pcb, mainly the electrolytic capacitors negative terminals could have been marked with a clearer black bar instead of the - sign but all of this is very well documented , this was just the only thing i had to look up from the build guide. Also I put an 24 pin socket under the YM3812 which was not included since it is not necessary. Little board with great oldschool sound! Easy assembly and great sound. example code looks very good, hope it will help me to create my own sounds! i would totally recommend this board to anyone interested in digital music and electronics. Kit is easy to solder and suitable for beginners.